We had a great weekend in Orlando. It was great to get away for a few days and see some family (Alex's mom, aunt, cousin, my sister, and my brother-in-law). It was also great to be able to explore more of Orlando besides just Disney World. It's a neat town! 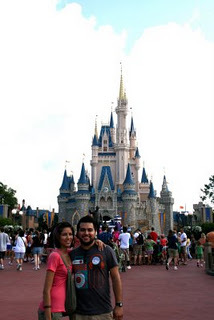 Of course, Magic Kingdom was magical. And the Blue Man Group was phenomenal! I posted an album on facebook so you can see many of the photos. I'm ready to go back and visit the great city of Orlando again. Vacations should be longer. P.S. We were not allowed to take pictures or video during the Blue Man Group Show, so for those of you who are curious about what exactly goes on at these shows here's a "megamix" video from youtube.